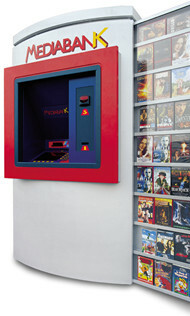 The Mediabank kiosk is the solution for the installation of an automatic dispenser in places where shop windows are not available, for instance in supermarkets or in petrol stations. It uses an MBK CLASSIC distributor and an externally attached frame. At the kiosk, product posters can be fixed to the dispenser; so a pleasant showcase is created for consultation.